What’s wrong with my network? What’s causing a voice quality problem? How do I prevent these issues? These are questions that IT and voice network admins ask on a daily basis. It is their job to ensure reliable network performance for users of unified communications services, and investigate to pinpoint the root cause of network problems when they occur. Mitel Performance Analytics R2.3 makes this job easier, with Agent-Based Network Testing. Probe or agent-based monitoring collects a range of performance data from monitored devices and reports them to MPA, and also allows IT admins to access devices on remote networks. In MPA R2.3, we’ve taken this concept a step further by using agents to test and monitor the performance of UC services. This feature runs, among other network operations, synthetic calls to test VoIP service availability, network performance and pinpoint the source of a problem more effectively with diagnostic tools customized to voice and video. SIP Call Test – One or more test calls are made between two test agents. Traceroute Test – Traces the path that an IP packet takes from a test agent to an identified target. SIP Registration Test – Attempts a SIP registration from a test agent to an identified SIP Registrar. External Call Test – A call is made from the test agent to an actual handset. Alarms can also be set on the tests to ensure that any issues discovered are raised for review. The test results accurately point you to the most important problems at the right time before they impact the customer. 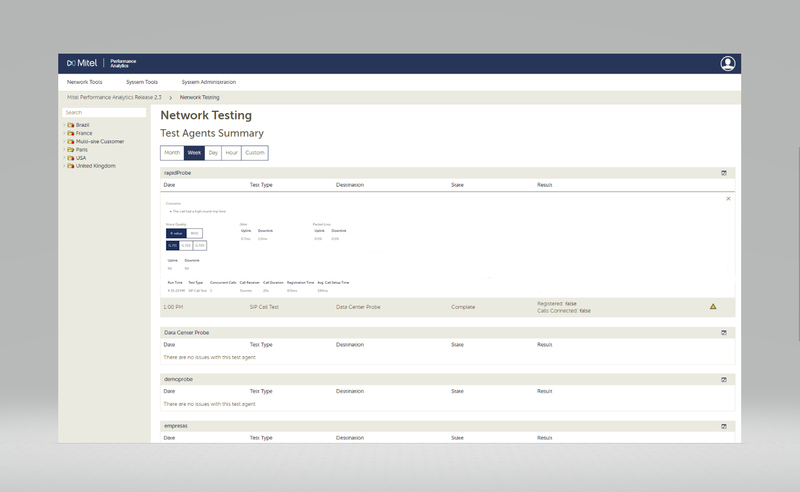 Agent-Based Network Testing can add an ounce of prevention to your network performance management toolset, with scheduled tests between agents detecting problems often before they can happen. These tests give you enough time to fix the issue before users are impacted. Finally, this feature troubleshoots network problems that have already taken place by quickly pinpointing and solving reoccurring issues. When a user experiences a poor voice call, IT admins can run or schedule synthetic calls to reproduce and diagnose the problem. With MPA R2.3, you can monitor and debug your network to ensure call quality is optimal. For more on the features of MPA, take a look at our MPA R2.3 Primer or the MPA R2.3 Demo Video.